If Pasche has a real regret (and the money issue is less of a regret since the original designs were sold last year to the V&A for a considerable sum) it’s that the graphic integrity of his work has been compromised: “Over the years it’s been redrawn a bit, and to me it doesn’t really look quite right. I think what happened initially is when the artwork was approved it was faxed over to the States and they received—well, you can imagine the black and white fax, a horrible looking thing! So obviously it had to be re-drawn but it wasn’t re-drawn as well as the original. I think that is quite often the version that you see. I find it difficult to look at the versions of it—as a designer it just irks me a bit. But I have to say; I think it has been used quite cleverly over the years in different forms on the various tours. And I think that’s probably Jagger again. It’s quite a clever idea presenting it a different way relating to a particular tour.” And so John Pasche hosts another batch of film crews from France and Germany and Argentina, all come to talk to the man who caught lightning in a bottle and the Stones in an icon. 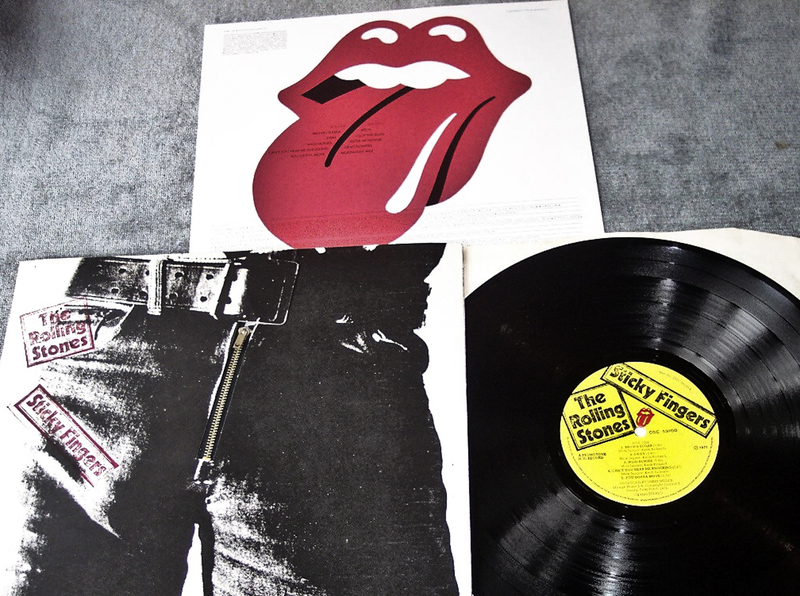 Just in the time I was writing this I saw the tongue logo made up of small red mirrored tiles adorn a huge shop window display, I saw it on four T-shirts, and in countless magazine features on the Stones anniversary and, finally, as graffiti on a wall in a tv documentary. It will probably outlast the career of the Stones, ending up as a free-floating image, beyond taste, imbued with whatever meaning (or not) that the beholder or wearer invests in it, a kind of tongue–and-lip tabula rasa. Video promos and downloads have diminished the value of sleeve art in the eyes of music companies, and illustration doesn’t fit their brand-building approach to bands. But there are still some true believers in the power of sleeve art. Let’s go backstage with Aimee Mann and Gail Marowitz, purveyors of finely crafted record sleeves. When Alex Steinweiss went to his boss at Columbia Records in 1940 and said that albums should have illustrated covers that reflected their musical content he started a revolution in record cover design. Sonatas, Big Bands, Crooners – each release in each genre had its own personalised cover, and sales went through the roof. All of the major labels immediately followed suit, and the golden era of record cover illustration commenced, with Steinweiss joined by greats like Jim Flora and Bob Jones. Two things brought it to an end: improvements in printing technology, which allowed photography to finally shine, and the Cult of Personality, built up around popular singers, which was better fostered by glamorous studio portraits. The use of Illustration became patchier, and often sprung from a scene with its own driving aesthetic: Heavy Metal, where the lyrical bias has strong elements of both fantasy and horror; Psychedelia, which gave us Rick Griffin and Stanley Mouse; Disco, which channelled Warhol and commercial art; and Prog Rock, whose king was Roger Dean. But often this work didn’t illustrate much beyond an atmosphere, or a kind of basic stylistic look associated with the genre. That’s not to say that there aren’t many great illustrated album sleeves, but they are mostly one-offs that have little connection to the artist beyond that single project; they are not part of a sustained artistic endeavour. For every Radiohead, where there is a consistent use of one (fine) artist, there are many one-time-only-then-discarded classics (Andy Warhol and the Stones’ Sticky Fingers, say). The longest creative relationships tended to happen in the artistically-driven glory days of the 70s, when Neon Park worked with Little Feat, or Cal Schenkel with Frank Zappa, but nowadays the mainstream tends to avoid illustration, as it doesn’t often fit in to a brand-building approach. In 2000 singer-songwriter Aimee Mann was having another fight with her record label. She was refusing to put her face on her next album’s cover. She had been through the pop mill with her successful first group, ’Til Tuesday, and hated being asked to conform to their ideas of how her personal and literate songs should be presented to the public. She became so frustrated that she ended up buying back the album, determined to release it herself. Mann, for her part, has always taken an interest in design: “I love graphic design. My father was in advertising, and my favourite books when I was growing up were those old Grafis annuals.” For a songwriter who is lyrically concerned with the nuances of relationships – with the wide canvas of the struggles and pitfalls of modern life – to have all of this processed by the record industry to a smiling 8”x10” on the cover of a CD seems reductive at best. If a publisher buys a novel from an attractive young writer they still don’t put her on the front cover, because the book isn’t about her, the book is a narrative. At this point it’s Marowitz’s job to sort out the form that the package will take, and then cost it— the die cuts, the special inks, the typography (“of course, that’s my bread and butter, what I love”). With 95% of the CD cover work that she does the packaging options come down to a jewel box or a digipak. It was a project that played to a comic book artist’s strengths. The CD package became a short graphic novel. The gorgeous almost-monochrome drawings caught exactly the tone of the music, where 50s sci-fi sound effects led into songs of failure, paranoia, and hope. Marowitz remembers that, “Seth almost art directed me. He understands the process, he was brilliant to work with, and I learnt stuff. What is quite funny about Seth is that he kind of exists in a time warp. I don’t know if you know him, but he wears clothes from the 30’s and 40’s, and when I talked to him about Aimee’s project he’d never heard of her – he told me ‘I only listen to music on a Victrola’, like Robert Crumb… and he would send me, I swear to God, inked mechanicals with registration marks that I had to scan and construct on the computer. Marowitz actually bought a batch of 40 vintage pulp novels at an auction, and scanned the pages for use as background textures, as well as taking inspiration from the type and copy lines for the package. Mann had explained the boxing scenario to Owen and he did the illustrations to fit in the ‘chapters’, a simpler project than Lost In Space. Marowitz made Mann rewrite the lyrics into prose to carry through the conceit. The title referred to a boxing move, where the boxer leads his opponent’s focus away from the potential blow that will take him out, the ‘forgotten arm’. Mann decided that although the painting she had seen was perfect for the cover, it wasn’t right to use an existing image. It should be, like the other illustrations, created just for this project. Now she thinks that the image she asked Owen to create was probably a little too complicated, and a little too literal. Notwithstanding that, the package won the ‘Best Recording Package’ Grammy for 2006. From the classic muted oils and beautiful pencil work of Owen, @#%&*! Smilers, the next album, leapt into the high-key universe of illustrator Gary Taxali. “Smilers has cartoon elements, it’s very graphic, it’s a little collage-y, and it’s funny ’cos I’d seen his stuff at the same gallery as the Owen show,” says Mann. Gary’s layers and quirks fit perfectly with Mann’s tales of eccentric Californian personalities living far from the bright lights of success or fame. Gail Marowitz currently works as creative director for a record label (Roadrunner Records) whose stock in trade is heavy metal, a genre that has always been visually based in illustration as opposed to photography. Nick de Ville’s Album was extremely helpful in the writing of this article. This is the illustrators’ perspective on Aimee Mann’s ambitious sleeve projects. Gail contacted my agents about doing the cd book as a graphic novel but that was simply too much work for me – comics are so time-consuming and laborious that I nixed this idea and suggested we take another approach. I simply couldn’t afford to take that much time away from my own work. After that initial decision I was given a huge amount of leeway to figure out what I wanted to do. Of course, the first thing I needed was a CD of the music. Once I had that in my hands I was ready to sit down and figure out where to possibly take the design. Were you aware of Aimee’s music before being called? I am Mr. Old Fashioned. I had stopped listening to contemporary music sometime in the 1980’s when I started exploring old jazz. When I was initially contacted I did not recognize Aimee’s name (I would not have recognized almost anyone’s name in the current Music industry). However, friends alerted me to the fact that Aimee had been around in the 80’s with ’Til Tuesday and then I recalled her work. Before I listened to the CD I wondered if I could possibly like it – I had been so out of touch with contemporary music. It seemed doubtful, but then I was pleasantly surprised to really be absorbed by it. It was a beautiful album – deep, emotional, profound. In fact, long after the work was finished I continued to listen to Lost in Space and of course, I still play it often. I think it’s a great album – easily my favourite of all of her music I have heard. I feel lucky that that was the one I worked on. How did this project differ from other commercial projects that you have done? I was given enough freedom that I stopped thinking of the job as just a commercial project and actually took it to heart as a piece of my ‘real’ work. The project was not completed with the cold approach of a ‘hired hand.’ The collaboration was a dream. Aimee gave me her songs and her lyrics and then I put together a small mock-up booklet. I flew down to NYC and we met and talked about it. She did nothing but encourage and support every decision. She never interfered or pushed her particular vision on me. In fact, I had a couple of comics sketched out to use in the book and I showed them to her. I was the main character in them but I said, “Don’t worry, I will rework these ideas with a female character” and Aimee just told me not to worry about it – to leave them as they were. That surprised me actually. It was very generous of her to allow ‘me’ (as an artistic presence in the work) to share space in her actual album. I didn’t prepare a back up plan – I always work this way – go with what you most believe in first… but I was always prepared to work something out if it didn’t excite anyone. How did you like the finished result? I was entirely happy except for my own limitations. I see all kinds of things that I would like to correct in the work… but these are errors of my own. Poor drawings or bad decisions. In the fancier version (the book format) I wanted a totally metallic blue to be used on the cover image and Gail talked me out of this. I think I should have held my ground. I’m not so crazy about the cover on that one. It has some bad decision connected to it. My decisions. I would almost like to do the whole thing over now. I’ve learned a lot since I did that project and I could certainly do a better job now. But, you can’t revisit old work. It’s too late. Maybe Aimee and I will work together again sometime and I can apply what I have learned to new work. I still love the music on that album though. That hasn’t changed. SETH is the pen name of Gregory Gallant (born September 16,1962). He is the cartoonist behind the long-running comic book series Palookaville, a new hardcover version of which will appear later this year. His books include Wimbledon Green, George Sprott, Clyde Fans and It’s a Good Life, If You Don’t Weaken. He is the designer for The Complete Peanuts, The John Stanley Library, The Portable Dorothy Parker and The Collected Doug Wright. His cardboard city of Dominion is currently touring Canada. I first got a call from Gail who said she was working with Aimee on another album. She said Aimee knew my work from the L.A. gallery La Luz de Jesus owned by Billy Shire. I had some boxing images hanging there. Gail asked if I would be interested in working on the project and then we soon had a conference call with Aimee. She explained that the songs were a narrative involving an ex-boxer and his girlfriend (Aimee is interested in boxing). I was pretty excited. I was aware of Aimee’s music. I remember her from the ’Til Tuesday days and followed her solo career. How did this project differ from other commercial projects you’ve have done? I haven’t done much work related to the music business. I’ve done illustrations for Rolling Stone over the years – oh and Meatloaf once invited me to his recording studio to discuss a record album cover job (interesting meeting… he never liked my concept sketches). This project was very comfortable because it felt like I was illustrating a novel. I’ve heard nightmare stories about working with musicians and bands. There was no ego here. Gail is a legendary designer and Aimee is very artistic and understands picture-making. They hired me because I was appropriate for the concept, and let me do my thing. I was given a demo tape and the lyrics. The album has a loose ‘plot’ and we interpreted them as film noir stills or pulp novel illustrations. How did you chose the look of the characters? The guy was easy… noir ex-boxer-tough. The woman I thought should be basically a strong person but with some vulnerability, like the good girl in a noir film, not the femme fatale. She should have qualities of Aimee but not be her. The beautiful monochrome drawings – were they always intended? With just colour on Chapter Seven? The intention was always a color cover and monochrome interior, like an old pulp magazine with fading color cover and black and white drawn interior illustrations on yellowed ‘pulp’ pages. The other color painting inside was added later. How did it feel to be asked to add to someone’s singular vision, becoming the face of Aimee’s project? Aimee and Gail were very smart to use an illustrated cover (I’m not just saying that because I’m an illustrator) When I went to the record store it jumped out of the clutter because people rairly use illustration anymore. The cover stood out and completed an idea: Story, Songwriting, Performance, Book, Cover. OWEN SMITH’S illustrations have appeared in Time, Esquire, Rolling Stone, the New York Times Magazine, GQ, Entertainment Weekly, and numerous times on the cover of The New Yorker. Influenced by WPA artists of the 1930s and muralist Diego Rivera, Smith holds a BA from the Arts Center College in Pasadena. His first picture book, Ray Hicks’s The Jack Tales, was published in 2000. This project was different because I worked directly with the musician—there was no middle-man calling the shots. The three of us discussed everything, down to titling the album, and communicated with each other from the very beginning what we had in mind. The great thing is that we all shared the same ideas on the look and feel of the entire package. Gail’s use of typography was so complimentary to my work, it was hard to see any seams between her graphic design and my illustration. She is a brilliant graphic designer. I think this is the future of the music industry when it comes to album illustration and design. It is going to entail the musician working directly with the graphic artist. But the best thing about this package was that Aimee spared no expense in the final production. In the limited edition package we actually used steel bolts to bind the book together. Exquisite design and exquisite printing is something that no record company does anymore. This is a wonderful antidote to illegal downloading of music, giving the fans a wonderful product that you can never get with a free MP3. I think the fact that we were nominated for 2009 Grammy for Best Package is no surprise! Were you asked to work literally, or asked to bring your take? When we started the songs weren’t all complete. Some of them weren’t mixed yet and one had its lyrics and title changed. Aimee talked a little bit about some of the songs and meanings behind them and sent them all to me. So I sat with them for a good while and listened to them over and over before I started doing sketches. It was encouraging because everything I drew, Aimee and Gail liked. It was really inspiring to work with Aimee because the music and lyrics are so smart with so much visual potential that it was really easy to come up with ideas. Yes, I was asked to bring my take. That’s the only way I work. There’s a great mixture of finished and sketchbooky images on the CD. How did that come about? In three of the pictures, and I’m not going to say which ones, I asked Aimee to draw some sketches, and I included them in the final illustrations. So you can say that with Gail’s typography, Aimee’s drawings and my illustrations, I really had a cohesive collaboration with them. It was one of the best projects of my career. The weekend the record was released, Aimee and I supported it with a show of the original artwork and a limited edition print. We did the signing of the CD’s release in an LA gallery. It was then I really got to appreciate the finished product by seeing people’s reaction for the first time. Aimee and I plan to continue working together, and that includes a potential book project. GARY TAXALI is an award-winning illustrator, fine artist and toy designer. He has worked for many clients including Time, Rolling Stone, Esquire, GQ and Newsweek. Aside from his gallery shows and illustration work, Taxali also devotes a portion ofhis time teaching and lecturing at various arts organizations and schools. His first children’s book, This Is Silly was published by Scholastic in Summer 2010. He lives and works in Toronto.